Caroline Buchanan catches major air at Crankworx’s first ever Riverside Women’s Only Jump Jam. Katie Lozancich Photo. The chatter of the nearby creek was quickly drowned out by the music and cheers from the spectators at Whistler’s Riverside dirt jumps. 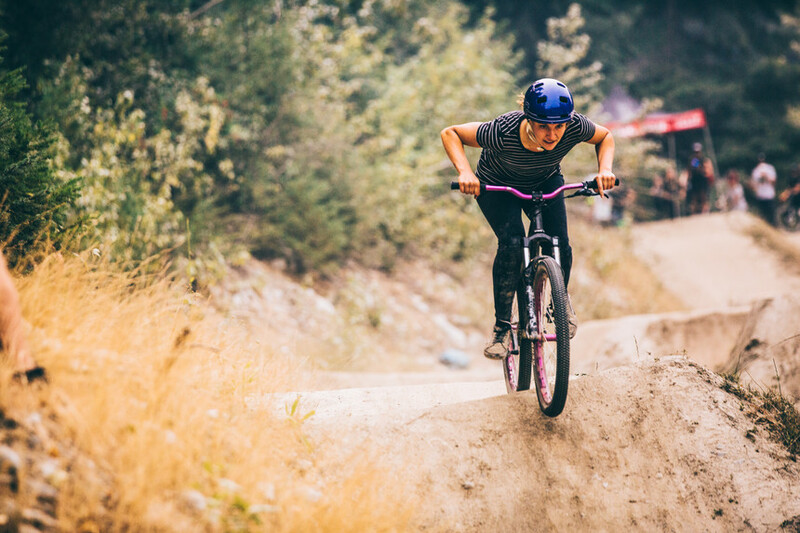 Surrounding me on the starting mound were a group of 15 ladies participating in Crankworx’s first-ever women’s jump jam, with their attention fixated on the series dirt jumps that lay before them. “I showed up this morning not quite sure what to expect, this line is actually quite challenging,” Caroline Buchanan told me while pushing her bike back to the start of the line. Buchanan, who then flowed gracefully through the steepest line, couldn’t contain her enthusiasm over what transpired. She had been attending Crankworx ever since she was 15, and had never been on these jumps before today. Those who gathered here, whether they realized it or not, were witnessing an unprecedented event. Open to ages 16 and up, the dirt contest allowed for women to compete alongside other stylish riders for a cash prize. 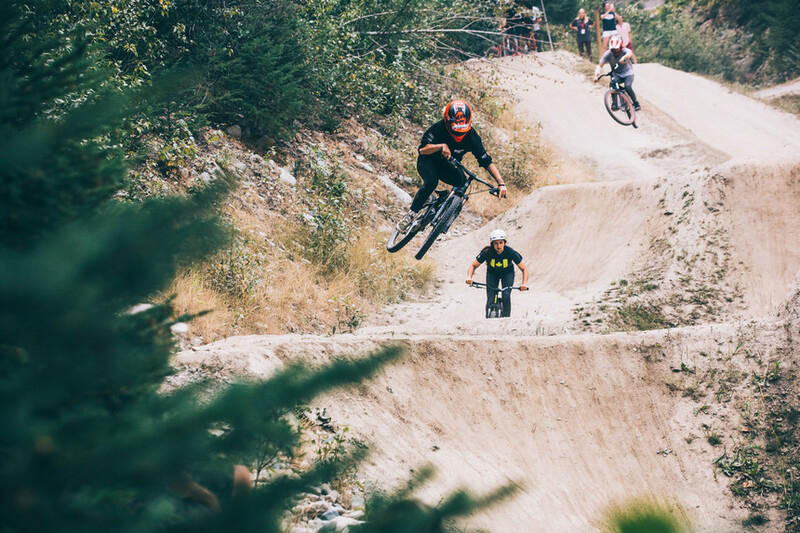 It was not just a skills event; it was reflective of the push to include more women’s freestyle events here at the Crankworx mountain biking festival. Initially, the energy was a mixture of apprehension and excitement. The jumps on the most prominent line were especially daunting, and with one wrong move, they were especially unforgiving. Manon Carpenter, a pro downhiller with many race wins and jump jams under her belt, ended up breaking her collarbone with a misplaced landing. Her absence from the rest of the competition was a huge loss. Just a few days before the event, she entered the Crankworx Whip-Off for the first time and walked away with an impressive 2nd place finish. One of the best parts of the event was many of the ladies found new friends to session the jumps with. Katie Lozancich Photo. The event suffered a major loss of talent when Manon Carpenter fell and broke her collarbone on the double black line. Katie Lozancich Photo. This becomes an even more impressive accomplishment when you discover that she just started attempting the Crab Apple hits a few days prior to taking the podium. Carpenter, who recently retired from downhill racing, is a greater representation of the emerging force of women breaking boundaries within freestyle riding. Before her crash, she was holding her own among the rest of the girls who faced the more challenging line. Her fall, while severe, was not the only one of the day. Many of the girls got back atop the starting mound in jeans smeared with dust and dirt. Crashing, a natural byproduct of progression, simply would not slow them down. Instead, they merely dusted themselves off and kept going. “I like this environment because I think the best way to progress women’s sports is to have other women to challenge you,” said Buchanan. At first, no one was hitting the big line, but once a few of the riders like herself found their groove, they began taking bigger risks. Each jump became bolder than the next, either with height or added tricks, to the point that they began throwing big whips and one-handers. “As soon as one does it, it gives you the confidence to go out and try it,” Buchanan, who won the event, explained. Fresh off a severe injury, she took a unique approach for this year’s competition season. She knew that she wasn't at her prime for racing, so her attention shifted to freestyle riding. This year she's enjoyed building out her bag of tricks, which she’s been transitioning from BMX to mountain biking. Close on Buchanan’s tail was Stephanie Nychka, who was later awarded second place. Nychka, who caught the crowd’s attention with her bright attire, billowing blonde ponytail, and massive air, is no stranger to freestyle riding. In fact, she’s the first and only woman to compete in a Crankworx Slopestyle back in the festival’s early years. In 2003 she was also one of two women to be invited to Redbull Freezride, which was an inventive freeride mountain bike competition that was held in Whitefish, Montana. This unique event combined riding on both dirt and snow, including a run through the ski resort’s slopestyle jib park. From these experiences, Nychka has developed quite the passion for dirt jumping and slopestyle. She developed SlopeSistair, which was a women’s freeride event between 2005-2007 that brought together women from all across to country to compete in freestyle riding. Nychka, who now balances raising three kids with her small business, couldn’t turn down the opportunity to compete at the Jump Jam event. Nychka hits the infamous Kokanee wall ride at the 2007 WomenzWorx Event. Even though it’s been years since Nychka has competed at a freestyle event at Crankworx, Nychka hasn’t lost her style. Katie Lozancich Photo. “I hadn’t attended Crankworx in years and was excited to experience that again as well as see so many of my riding friends,” she explained to me after the event. However, she thinks that for next year’s event things could be structured much differently. “Honestly, I’d have preferred riding the men’s [slopestyle] course to [the dirt jumps] but scaled down so everyone could participate—I think it would draw both more athletes and audience,” she explained. 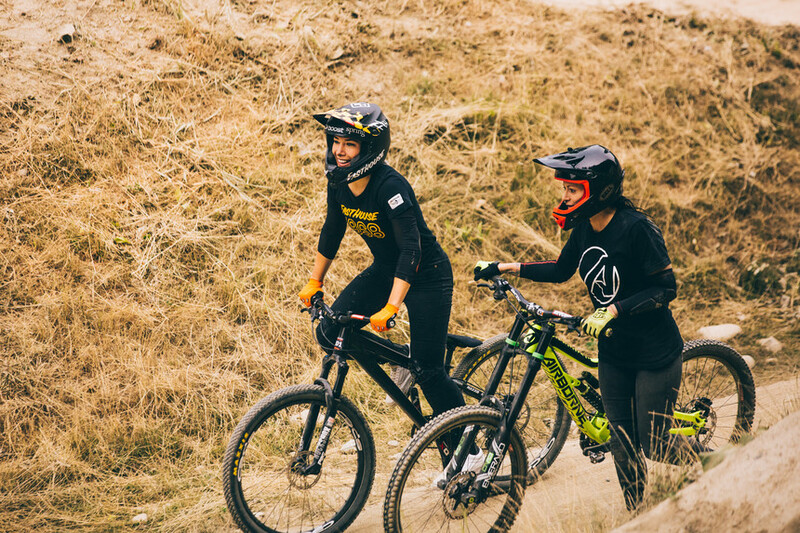 While she enjoyed meeting and riding with new women, she found the larger jumps to be technical and intimidating for the majority of the women who rode. Buchanan and Brandy Writz can't help but smile as they head up for another lap. Katie Lozancich Photo. The jump jam did more than showcase the skills and style of these women; it was a massive milestone for Crankworx. Aside from the Whip-Off, which only a few women compete in, before today, there haven’t been many platforms for women to showcase their freestyle skills. That void is most apparent in the festival’s most celebrated event, Red Bull Joyride.This year, over 35,000 people flocked to the boneyard trail after the jump jam to watch slopestyle’s elite, all men. While the crowds were much smaller down at the Riverside jumps, the excitement at the jump jam was on par. It shows that athletes, spectators, and the festival itself are ready for a new chapter in Crankworx: women’s freestyle. Buchanan was out training with the men in this year’s practice for the Dual Speed and Style. While she didn’t officially compete in the event, she hopes that women will have the opportunity to participate next year. “If the men can have judged sports, then the women can have judged sports—which starts with events like we had today,” she said. Lisa Mason, who organized the Jump Jam, has long been advocating for female freestyle riding. She’s also the founder of the Women’s Freeride Movement, which is a group that aims to support and celebrate female riding. Having seen women send backflips and 360-spins, she’s been hounding Crankworx officials for a freestyle event of this nature for the past six years. While the event was small, it served as a perfect starting point for change, which has always been Mason’s goal. “Having the venue here [at the Riverside Jumps] was spectator friendly, and I think that helped out a lot,” Mason said. Crankworx did try to give women a multi-disciplinary contest to compete in 2007 and 2008, called “Womensworx,” but it didn’t quite hit the mark. “It seems the time just wasn’t right,” explained Crankworx communication manager Julia Montague. “But finding ways to showcase and reward all aspects of women’s riding is something we’re constantly working on.” In comparison to other high-profile mountain biking events, Crankworx sets an exemplary standard. In 2015 they introduced equal payouts for men and women, as well as shared podiums. It’s a message that’s become their cornerstone: women and men should be treated equally within mountain biking. In light of their more recent female-focused initiatives like the Women in Action Sports panel which is held at the Whistler leg of the tour, the timing seemed perfect to host the Jump Jam, and it ultimately exceeded their expectations. “On a day like Red Bull Joyride, arguably one of the biggest mountain biking events in the world, to showcase our women who are pushing the limits of style, alongside the men, hopefully, sends a message and sets a direction for where things are headed,” said Montague. For what’s next, Montague argues that the sky is the limit. The railings of the riverside jumps were fully packed with eager spectators to watch what these ladies had to offer. Katie Lozancich Photo. Sarah Walter walked away with the bronze for her consistency on the jumps. Katie Lozancich Photo. No shortage of lady trains during the event. Katie Lozancich Photo. Jumping alongside the rest of the gals, Mason was elated when we met following the event. In her eyes, there’s still a lot to improve, particularly surrounding the payout and the number of riders participating, but for now, she is celebrating this as a huge step in the right direction. “Eventually it doesn’t even have to be a women’s jam, and it’s open to everyone, and we’re all just shredding together,” she said. The best part of the event was when the judges had made their decisions and given awards, the ladies, well, they kept on jumping. In the end, it wasn’t about winning or losing. It was just about getting out there and pushing yourself in the company of friends. That particularly held true with Buchanan, who kept rallying the line long after the competition wrapped up. She had been testing her limits all day by throwing a hand or foot free while flying through the air. These small steps of progression would eventually manifest for her final run of the day, in which she boldly released both hands from the handlebar for her first tuck no-hander. The crowd roared with cheers and Buchanan beamed from head to toe. That felt better than that giant prize check.